I should have bought Rebecca ages ago. Like 15 years ago. I happen to love the film--it's part of a long-running inside joke with my mother and my grandmother. It wasn't until I got to college that I realized the way in which du Maurier was attempting to pawn off some Charlotte Brontë as her own, but I kind of don't even care. Sure, Edward Rochester and Maxim de Winter are shades of the same character, but so what? It's a good time. The Jungle Books (comprising of The Jungle Book and The Second Jungle Book) is a collection of stories that I've also been meaning to read for some time, and is just one of those things that I feel like every collection needs. This may be it for me buying books for myself for a little while. I have a whole large shelf of books that need to be read, and every time I buy a new book I wish I was going to read it before all of the others. Best to curb that, if only for a short while. On a special note, one of my co-workers found a copy of Dawn of the Dreadfuls in his laundry room, and has been reading it. At first he didn't think he would, but he picked it up on a whim, and found it to be "very very funny." He has offered to lend it to me, as he finished reading it this weekend. 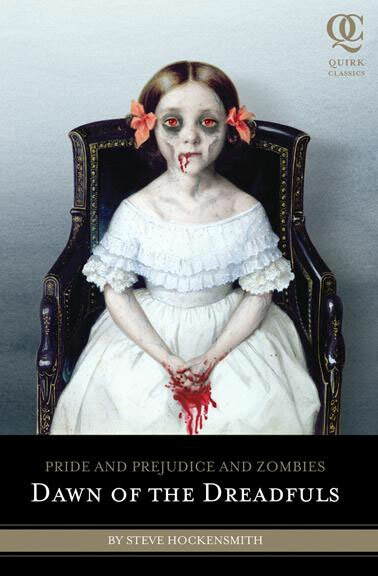 Having already read the two books that follow Dawn of the Dreadfuls in the Pride and Prejudice & Zombies series, I look forward to bringing it to a close, albeit a backwards one. Just promise you will NOT, under ANY circumstance, read the sequel to Rebecca. It is hideous! Worse that hideous! "I will make no promise of the kind, and I beg you not to importune me any further on the subject." Dearest Mama, You know that I abhor any other person's attempt to curb my reading. If I feel it merits reading, I'll read it. And perhaps I shall agree with your summation, but I have to come to that conclusion on my own.